Dracovenator: Worst case of mistaken identity since Aachenosaurus! Thankyou to everyone - and happy Australia Day! Where do spiny sharks go? A new Beipiaosaurus - beautifull plumage! Worst case of mistaken identity since Aachenosaurus! Aachenosaurus is an infamous a case of misidentification where some pieces of petrified wood were mistaken for dinosaur bones, and a name was coined for them in the literature. 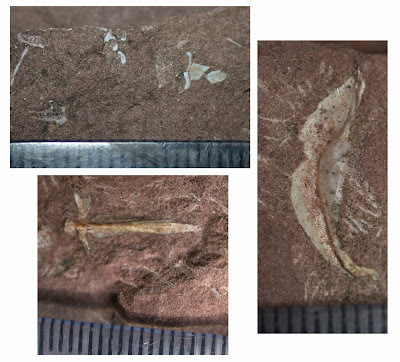 The small pieces of bone in the photos above were also strikingly misidentified in the BPI catalogue as belonging to a dinosaur (though fortunately never published as such). They actually belong to a fish, a ray-finned fish (actinopterygian) to be a little more precise. As fish they are very interesting because the come from the upper Elliot Formation, and as far as I can tell are the first recognized ray-finned fish from this unit (lungfish are known from the odd small toothplate here and there). The upper Elliot Formation was deposited in arid conditions with most of the streams being small and ephemeral. Nonetheless ray-fins can’t cocoon themselves when their pond dries up the way some lungfish can and their presence indicates that some permanent water bodies, however small, existed on the upper Elliot floodplain. That’s all I can say about this fish right now - the fossil will be subjected to further prep and study. Talk about mistaken identity. That happened to the Dromaeosaurs after the First Jurassic Park was released. I have a paper sitting at home whose title says it all - "Trigonocarpus excrescens Janssen, 1940, a supposed seed from the Pennsylvanian of Illinois, is a milliped". If you don't know what tanaidaceans are, they're crustaceans. It was a completely preserved specimen. The one on the right is part of Mick Jagger, I believe. These are bits of a semionotid, probabaly Semionotus. Above left are some scales and bits I can't recognize; lower left is a parasphenoid, anterior to right, posterior bits broken off; lower right is an upside down cleithrum, in present coordinates, anterior is to right.